This piece is part of Ting Yuen's "Tarot" line within the Artist Diary series. This is "The Star" Tarot card, which to me is about creativity. Creativity comes from an endless overflowing well of inspiration, and I feel very fortunate to be able to tap into it. It works like a cycle. 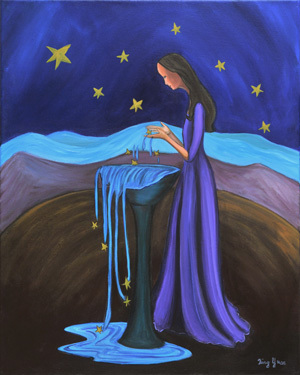 The stars in the water symbolize the five senses, nourishing what I create here on earth. Those in the sky symbolize the Universal consciousness giving inspiration back to me.